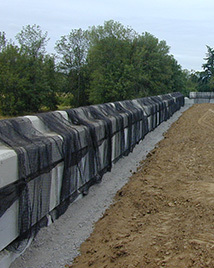 MSE Walls, or tieback walls, are best used in "fill" slope situations. They are built with a combination of blocks and geogrid tiebacks. Ultrablock units are an excellent replacement for small block walls, because an installer is able to place 12 square feet of face at a time. Typical installation estimates are 10-12 blocks per hour. 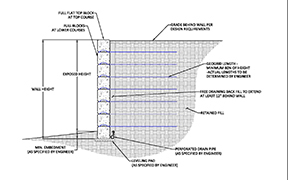 MSE walls incorporate GEOGRID products to reinforce the wall. These grids allow walls to be built vertically, with a minimum amount of block. For more information on using GEOGRID products with Ultrablock, please email us sales@ultrablock.com. 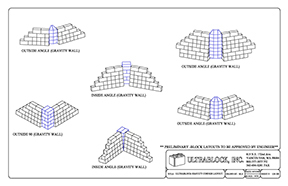 For information on installing Ultrablock MSE walls please refer to our MSE Field Construction Manual.